'Systems-wide' approaches such as microarray RNA-profiling are ideally suited to the study of the complex overlapping responses of plants to biotic and abiotic stresses. However, commercial microarrays are only available for a limited number of plant species and development costs are so substantial as to be prohibitive for most research groups. Here we evaluate the use of cross-hybridisation to Affymetrix oligonucleotide GeneChip® microarrays to profile the response of the banana (Musa spp.) leaf transcriptome to drought stress using a genomic DNA (gDNA)-based probe-selection strategy to improve the efficiency of detection of differentially expressed Musa transcripts. Following cross-hybridisation of Musa gDNA to the Rice GeneChip® Genome Array, ~33,700 gene-specific probe-sets had a sufficiently high degree of homology to be retained for transcriptomic analyses. In a proof-of-concept approach, pooled RNA representing a single biological replicate of control and drought stressed leaves of the Musa cultivar 'Cachaco' were hybridised to the Affymetrix Rice Genome Array. A total of 2,910 Musa gene homologues with a >2-fold difference in expression levels were subsequently identified. These drought-responsive transcripts included many functional classes associated with plant biotic and abiotic stress responses, as well as a range of regulatory genes known to be involved in coordinating abiotic stress responses. This latter group included members of the ERF, DREB, MYB, bZIP and bHLH transcription factor families. Fifty-two of these drought-sensitive Musa transcripts were homologous to genes underlying QTLs for drought and cold tolerance in rice, including in 2 instances QTLs associated with a single underlying gene. The list of drought-responsive transcripts also included genes identified in publicly-available comparative transcriptomics experiments. Our results demonstrate that despite the general paucity of nucleotide sequence data in Musa and only distant phylogenetic relations to rice, gDNA probe-based cross-hybridisation to the Rice GeneChip® is a highly promising strategy to study complex biological responses and illustrates the potential of such strategies for gene discovery in non-model species. Bananas and plantains are large herbaceous monocots from the genus Musa of the family Musaceae. The vast majority of cultivated bananas are hybrids derived from natural inter- and intraspecific crosses between two diploid wild species, Musa acuminata (designated by genome A) and M. balbisiana (designated by genome B) . These diploid, triploid or tetraploid hybrids are of great economic importance in sub-Saharan Africa, South and Central America and Asia, where they are a staple food for an estimated 400 million people. Although Musa spp. are mainly cultivated in tropical and subtropical regions, rain water supply is often far from uniform so that more or less-pronounced dry seasons exist which have an impact on fruit quality and yields. To date there have been few comparative studies on Musa drought stress tolerance, but field observations suggest that B-genome confers greater tolerance to drought than the A-genome [2, 3]. Plants display a wide range of overlapping responses to biotic and abiotic stresses, and the diversity of physiological, biochemical and molecular strategies adopted during adaptation to unfavourable environmental conditions (including drought), creates particular problems for the scientist wishing to study and understand them [4–6]. Non-biased, 'systems-wide' approaches such as transcriptomics and microarray RNA-profiling are well-suited to the analysis of this type of problem and have provided many insights into the pathways of (a)biotic stress response and adaptation in a variety of model plant systems [7–11]. However, while cDNA and oligonucleotide microarrays are now routinely used for transcriptomic analyses in plants, the number of species for which commercial microarrays are available is very limited. For non-model plant species such as Musa where little sequence information is available, microarray development costs are so substantial as to be prohibitive for most groups working in the area. However it has been recently demonstrated that commercially available high-density oligonucleotide microarrays from closely related, heterologous species can be used to probe the transcriptomes of non-model plants. For example the Arabidopsis Affymetrix ATH-1 Genome Array has been used to study the transcriptome of Brassicacea species such as Arabidopsis halleri [12, 13], Thlaspi caerulescens [14, 15], Thelungiella halophila [16, 17], Brassica oleracea  and Brassica napus . In addition a tomato array has also been used to study fruit ripening and development in tomato, aubergine and pepper , as well as in potato . In spite of the economic and social importance of banana and plantains and its relatively small haploid genome size (amongst the monocots) of 560 - 600 Mbp [22, 23], little sequence information is publicly accessible. Available published data includes the complete sequencing of two BAC clones from a wild diploid banana cultivar , the analysis 6,252 BAC end-sequences  and recently the sequencing of 13 BAC clones and the analysis of 17 BAC clones collectively containing a total of 443 predicted genes . In addition, 5,292 unique foliar 24 bp transcript sequences were sequenced and identified in the cultivar Musa acuminata following SuperSAGE . The only transcriptomics study published to date however, describes the creation of cDNA libraries from Musa plants subjected to temperature stress. This lead to the identification of 2,286 high-quality sequences, of which 715 where considered to be full-length cDNA clones representing a set of 149 unique genes. . The aim of the work presented here therefore was to determine the feasibility of using commercial heterologous oligonucleotide microarrays to probe the Musa transcriptome in response to drought stress in the relatively drought-tolerant Musa triploid cultivar 'Cachaco' (ABB genome composition). The use of highly standardized, commercial Affymetrix GeneChips® arrays allows comparisons to be made with probe-set data sets from other plant species and helps to reduce cross-laboratory errors. Because of the phylogenetic relationship between target and probe, this work with Musa necessarily involves cross-hybridising to species that are evolutionarily much more distant than has previously been attempted. Clearly the success in identifying differentially-regulated transcripts via cross-hybridisation depends on the degree of similarity between the target and probe sequences. With the Affymetrix GeneChip® Genome Array, the expression level of any one particular gene transcript is generally calculated as the mean of the expression levels of the 11 - 16 perfect match (PM) 25 bp probe-pairs that make up the 'probe-set' for each individual transcript. Therefore inefficient hybridisation of transcripts from the test species of interest to the GeneChip® target probes, due for example to the presence of sequence polymorphisms, will affect the overall signal calculated across a probe-set, reducing the number of 'present' calls, and as a consequence the mean strength of the signal for that transcript's probe-set [14, 29]. To eliminate non-hybridising probes, Hammond et al, first carried out a cross-hybridisation with gDNA from the test organism. The results allow a 'probe mask' to be created by which weak- or non-hybridising probes can be discarded without discarding the signal for the entire probe-set for a particular transcript in subsequent analyses . The disadvantage of this method is that it can realistically only be used on microarray platforms that contain multiple probes per gene. Applying it to arrays with only one probe per gene (cDNA microarrays) will result in a much lower number of genes for which expression levels can be determined. An alternative approach is to create a 'Global Match File' or a list of 'highly reliable' GeneChip® probe-sets for analysis based on alignment to EST-derived clusters/singletons. This latter heterologous hybridisation approach has been used to study cold-induced sweetening of potato tubers using the Affymetrix tomato microarray , but its success depends on the availability of extensive EST sequences to create the Global Match File, and these are not yet available for Musa. Interestingly, gDNA-based probe selection has recently been shown to also improve the analysis of differentially expressed genes in homologous species, again by accounting for the impact of differences in the physical hybridisation characteristics of individual probes on probe-set signal intensities [18, 30]. Here we report on work to evaluate the use of commercial, high-density Affymetrix Rice and Arabidopsis ATH-1 GeneChip® microarrays to analyse complex plant responses in a distantly-related, non-model plant species. Using a gDNA probe-based cross-hybridisation approach we were able to rapidly profile the response of Musa transcriptome to chronic drought stress, and to identify a range of structural and regulatory Musa gene-homologues previously found to be associated with the water-deficit response in other (model) plants. Further, despite the large phylogenetic difference between Musa target and the Rice or Arabidopsis probes, comparisons to publically available transcriptome-profiling experiments identified a range of common drought-responsive genes, supporting the assigned Musa gene identities and descriptions. This approach outlines the potential of this strategy for the characterization of stress-resistance in banana and plantain varieties for which relatively little sequence information is currently available. Microarrays for a number of plant species are now commercially available. Of these, the Arabidopsis ATH-1 GeneChip® Genome Array is probably the best-characterised/annotated, containing over 22,500 probe-sets representing ~24,000 genes http://www.affymetrix.com/products_services/arrays/specific/arab.affx. Similar high density oligonucleotide Affymetrix microarrays also exist for important monocotolydenous crops, including maize, wheat, barley and sugar cane, but the Affymetrix Rice Genome Array contains many more probe-sets (~57,000), and covers a larger portion of the transcriptome than these other arrays. As can be seen in Figure 1, the number of probes retained decreases rapidly with increasing hybridisation intensity threshold (CDF) values, while the number of probe-sets (transcripts) retained decreases relatively slowly and only at higher CDF values. As a result the number of probe-sets retained for transcriptome analysis within a probe mask file remains high, even as more probes are excluded. For example after cross hybridisation to the Rice Genome Array, a probe mask created at a CDF value of 550, excludes 87.6% of the total PM probes, even though some 64.4% of the probe-sets are still represented by at least one probe-pair and can be used for subsequent transcriptome profiling. This is similar to the results obtained by Hammond et al following cross-hybridisation of B. Oleracea and Thlaspi arvense sp. gDNA to the ATH-1 Genome Array [14, 18]. In our case the average number of probes present per probe-set at an optimum CDF value of 550 was 2.0, with a total of 16,416 probe-sets being represented by a single probe-pair. Following hybridisation of 'Cachaco' gDNA to the ATH-1 Genome Array, only 1,321 probe-sets were retained at a CDF value of 0 (no filtering). This corresponds to ~5.7% of the total available Arabidopsis transcriptome. However at a CDF value of 500, 3,594 or 15.8% of the available Arabidopsis transcriptome was retained. Unsurprisingly, hybridisation of 'Cachaco' gDNA to the Rice Genome Array produced far better results, with over 78,000 probe-pairs corresponding to over 36,000 probe-sets (64.4%) being retained at a CDF value of 550. These results therefore broadly confirm the phylogenetic relationships between Musa and either Arabidopsis or Oryza with current estimates indicating that Musa and Oryza diverged at the level of the order Zingiberalae some 65 Mya, while the closest evolutionary link between Arabidopsis and Musa occurs at the point that the eudicots diverged some 145 - 208 Mya . Interestingly the existence of regions of microsynteny between rice, Arabidopsis and Musa have recentlybeen demonstrated . For example, even though Musa genes generally have a GC structure more closely resembling rice than Arabidopsis, out of 443 Musa predicted proteins, 268 and 224 had hits with an E-value threshold of 1e-10 to rice and Arabidopsis respectively. On the basis of the gDNA hybridisation results presented here and the closer synteny of Musa gene sequences to rice rather than Arabidopsis [26, 31], transcriptomics experiments were carried out with the Rice GeneChip® array rather than with the Arabidopsis ATH-1 GeneChip Array. The response of the Musa transcriptome to chronic drought stress was examined by challenging Rice Genome Arrays with 'Cachaco' foliar RNA, isolated and pooled from plants subjected to either 3 weeks water-deficit conditions or to control conditions, as described in 'methods'. 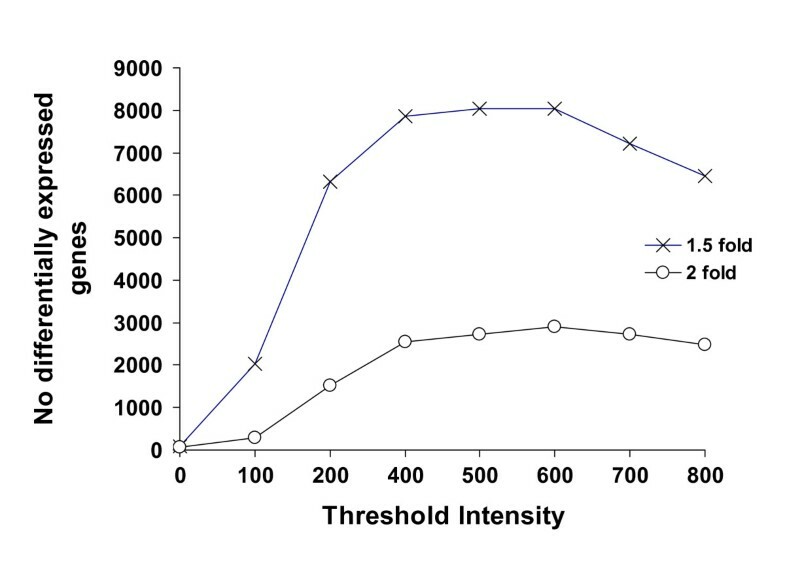 The ability to detect differentially-expressed transcripts depends upon the hybridisation intensity threshold cut off values (CDF values) used to create the probe mask (.cdf) files as summarised in Figure 2. As can be seen, there is a significant loss in the number of probe-sets retained at higher CDF values, but the number of differentially-regulated genes identified is still greater than when no probe-masking is used [14, 18]. Indeed at the optimum CDF value, over 40-fold more >2-fold drought-responsive transcripts are identified than is the case without masking (CDF = 0). The influence of the gDNA hybridisation intensity thresholds used to create the gDNA probe mask (.cdf) files, on identification of differentially-regulated genes, following hybridisation of labeled Musa gDNA to the Affymetrix Rice GeneChip ® arrays. 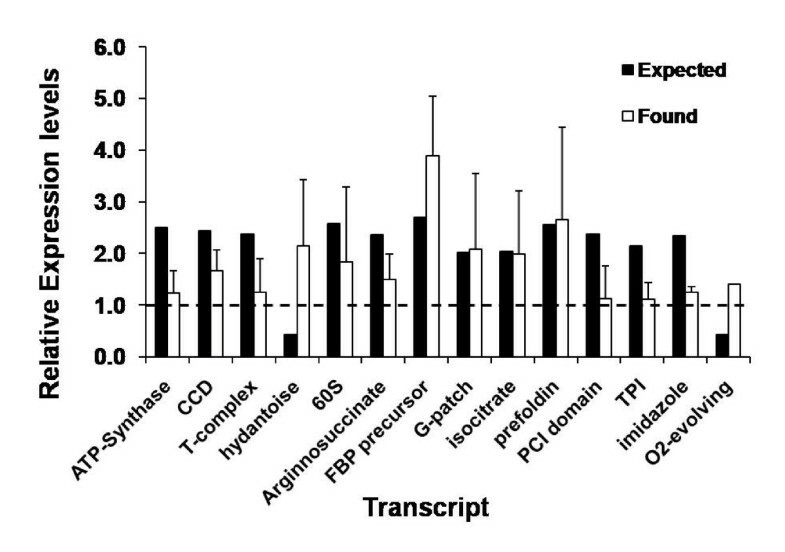 As shown in Figure 2, the maximum number of differentially-expressed transcripts was detected using a CDF value of 550. At this cut off level, a total of 5,292 (RMA normalized expression value >20) of the maximal 33,696 probe-sets hybridised to Musa RNA at levels above background suggesting that ~16% of the available Musa genome was being expressed at any one time. Based on a single biological replicate, 2,910 transcripts of these transcripts displayed a >2-fold difference in expression levels in response to drought conditions, representing ~8% of the total available transcriptome [see Additional file 1]. This value is similar to values reported in other transcriptomic studies of plant drought stress-responses. For example Talame et al  using a cDNA microarray found 173 barley genes out of the 1654 genes tested (~10%), to be differentially regulated following 7 days dehydration stress and Seki et al , found that 277 genes from a cDNA array of 7,000 genes (~4%), were drought-responsive in Arabidopsis. Clearly these responses are dependent on the tissue, the severity and length of exposure to stress, as well as the sampling time points [33, 34]. 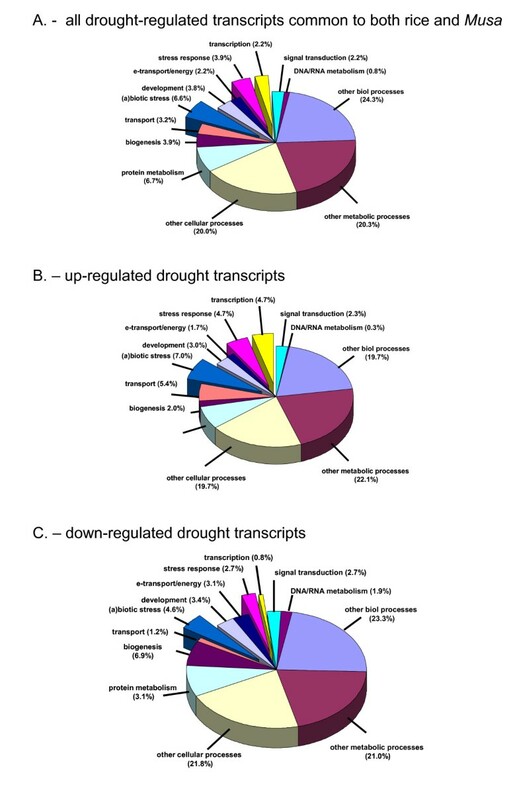 Of the 2,910 differentially-regulated putative drought-responsive transcripts detected, 1,671 were up-regulated (57.4%), with the most responsive transcript (Affymetrix probe-set ID Os.53488.1.S1_at; GenBank AK072922, 'expressed protein'), increasing 15.7-fold in relation to the control. The remaining 1,239 (42.6%) transcripts were down-regulated, with the transcript coding for a putative chlorophyll a apoprotein (Affymetrix probe-set ID Os.26751.1.S1_s_at; GenBank AK062299), being down-regulated over 100-fold. The rice descriptions and annotations for these 2,910 drought-responsive Musa transcripts were obtained from the list of Rice GeneChip® probe-set i.d.s using the HarvEST software available at http://www.harvest-web.org/. From this list, 1,512 genes (54.9%) could also be assigned an Arabidopsis annotation using the same software. These Arabidopsis annotations were then used for gene ontology (GO) classifications using the 'Gene Ontology' function at the TAIR website http://www.Arabidopsis.org/tools/bulk/go/index.jsp. Results are summarised in table 1. Functional gene annotations ("Biological Processes") of Musa foliar transcripts identified as being >2-fold differentially regulated in response to 3-weeks chronic drought stress. As shown in table 1, the distribution of >2-fold differentially-regulated transcripts between GO classes is similar for both up- and down-regulated transcripts, with in both cases the largest proportion (~67%) being represented by 'other biological', 'other metabolic' or 'other cellular' groups. However in agreement with models for plant water-deficit stress responses, there was a general up-regulation of genes involved in 'abiotic stress' responses, 'transport' and 'cell organisation and biogenesis', and a down-regulation of transcripts associated with 'electron transport and energy processes'. Of the functional genes, 137 (5.2%) were assigned to the group 'response to abiotic or biotic stimulus' and 85 (5.0%) to the category 'response to stress'. Because of their potential importance for crop improvement programs, there is much interest in identifying regulatory genes such as transcription factors (TFs) which are responsible for the coordinate regulation of the large gene sets involved in stress response and adaptations. The group of drought-responsive Musa transcripts included 72 genes (2.7%) involved in 'transcription' processes. Within this group there are 8 members (homologues) of the AP2/EREBP TF family, including two DREB family TFs (TAIR: At1g19210, At1g78080). Members of this family have been implicated both in the regulation of both dehydration and cold stress adaptation . Additionally there are homologues of 9 NAC-domain transcription factors (TFs), as well as 4 bZIPs, 8 bHLHs and 7 MYB-domain TFs. Again, members of these families have all been demonstrated to be involved in dehydration and/or temperature-stress-responsive gene expression and to have binding sites in the promoter region of stress-inducible Arabidopsis and/or rice genes - for reviews see [5, 6, 36]. In addition, and in common with results from other groups, we also observed the induction of TFs associated with biotic stress responses including for example several up-regulated members of the WRKY superfamily (TAIR:At5g56270, At4g01720, At4g01250, At5g01900) a family of genes known to be involved in the regulation of plant pathogen responses and senescence - for review see . The differential regulation of transcripts involved in both biotic and abiotic stress-response pathways is a characteristic of plant (drought) stress responses in part due to the role of stress-hormone signalling in coordinating common, overlapping responses and can lead to the phenomenon of 'cross-tolerance' [38, 39]. For example the early gene responses to both drought and salt stress are nearly identical, and members of the DREB TF family are involved in the ABA-independent transduction of both drought and cold signals [4–6]. GOs for the list of Musa putative drought-responsive genes were also assigned using the Genespring GX 7.3 software (Agilent Technologies, USA), based on Affymetrix NetAffx annotation http://www.affymetrix.com, the HarvEST rice transcript annotations as well as the HarvEST annotations for the equivalent Arabidopsis homologues. From these data, the GO classes that were over-represented in response to drought stress relative to the entire genome were identified. From this list of GO classes, the expression of genes involved in photosynthesis and phenylpropanoid metabolism were amongst the classes most greatly affected by drought conditions. To visualize the effects of drought stress in Musa on a cellular level, the Affymetrix Arabidopsis codes for the list of >2-fold differentially expressed homologues on the Rice GeneChip were used to run the 'MapMan' software . Although only 1,430 of the 2,910 rice transcripts had an Arabidopsis code, the results nonetheless generate an overview of Musa cellular responses to drought. As shown in Figure 3, the Arabidopsis homologues of the drought-responsive sensitive Musa transcripts map to a range of pathways and functions consistent with plant abiotic stress responses [see Additional file 2]. These include 'biotic' (bin = 20.1; p = 0.1908), 'abiotic stress' (bin = 20.2; p = 0.7611), 'hormone response', 'development' (bin = 33; p = 0.5379) and 'cell wall metabolism'(bin = 10.1; p = 0.3212). Although these mappings to the pathways are not statistically significant, probably due to the cross-species nature of the analysis, they do indicate the range of processes that may be involved in the response of Musa to drought stress. 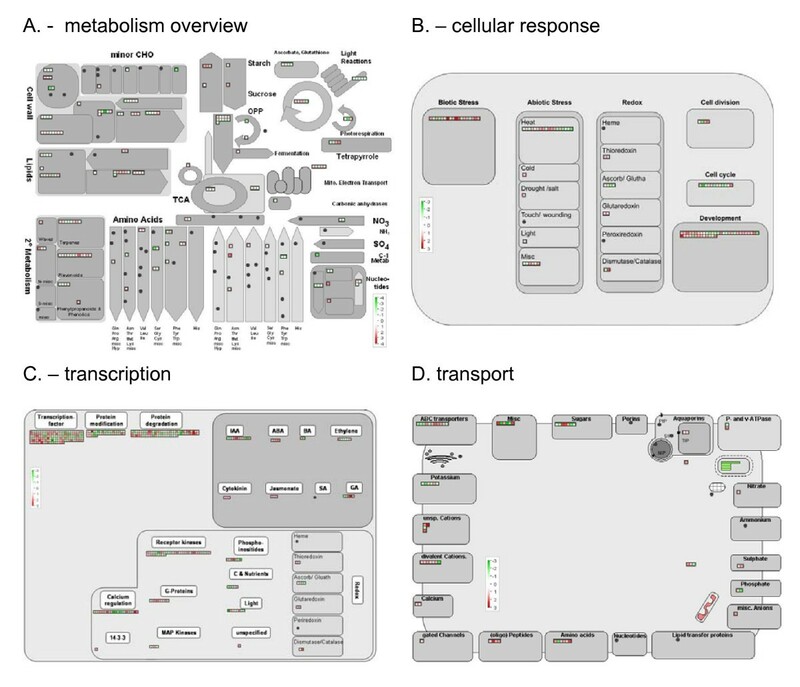 Overview of the changes in Musa foliar transcript levels in response to 3 weeks chronic drought-stress, for genes associated with A) metabolism B) cellular response C) transcription D) transport. Red and green represent a decrease and an increase of expression respectively, relative to control plants. Arabidopsis gene annotations for the list of >2-fold differentially expressed genes obtained from the HarvEST website. Interestingly only one Arabidopsis homologue (TAIR: At3g05890) was present in the drought/salt-responsive BIN. Rather, the majority of 'stress-related' transcripts were found in the 'heat', 'biotic stress', and 'development' BINs (Figure 3b). This again reflects the overlapping and redundant nature of plant responses to water-deficit stress. Other functional transcripts of interest were a number of homologues classified in 'redox responses', including for example a cytoplasmic Cu-Zn SOD (TAIR: At1g08830), known to be up-regulated in response to oxidative stress , as well as an up-regulated dehydroascorbate reductase transcript (TAIR: At1g75270, DHAR2), which is important for the maintenance of L-ascorbate pools, and which again is central to general stress adaptation responses [42, 43]. Interestingly, two transcripts encoding for a putative trehalose-6-phosphate synthase (TPS) were also up-regulated 2.2 and 2.4-fold respectively, and TPS overexpression has been shown to confer drought tolerance in several plant species . To help assess the biological relevance of these results, the list of drought-responsive Musa transcripts was compared to the list of genes underlying known QTLs for abiotic stresses in rice, obtained from the Gramene website http://www.gramene.org/. Of the 2,910 differentially regulated Musa genes, 52 co-localised to a total of 6 QTLs responsible for either drought or cold-response. These results and the functional annotations of all of the identified putative drought-responsive genes present at each QTL are summarised in table 2. List of rice homologues of drought responsive Musa transcripts that co-localise with known QTLs for 'drought' and 'cold' in rice. Each QTL described by it's Gramene website QTL accession id, rice map position and the range of genes underlying that QTL. Interestingly, in two cases the genetic determinants responsible for the QTL phenotype have been linked to a single underlying gene and homologues of these two genes were both present in the list of putative drought-responsive Musa transcripts. These two genes are (TIGR: LOC_Os04g23890) and (TIGR: LOC_Os11g03794) underlying QTLs-2 (drought susceptibility, trait symbol AQA045/CQ148) and QTL-5 (cold-tolerance, trait symbol CQP8) respectively. LOC_Os04g23890 encodes for the protein PHOT2 (non-phototrophic hypocotyl 1-like) which is a membrane-bound protein serine/threonine kinase functioning as a blue light photoreceptor in redundancy with PHOT1. PHOT2 is responsible for the trait 'drought susceptibility' and was 2.2-fold up-regulated in response to drought in Musa. Both PHOT1 and PHOT2 are thought to help optimize photosynthesis by capturing light energy efficiently and by reducing photodamage . LOC_Os11g03794 encodes for 'Aladin', a structural constituent of ribosomes and is identical to the cDNA 'Huellenlos' (HLL). In wheat, the HLL homologue appears to be involved in plant development, including development of the floral organs . It is tempting when looking at the list of other drought-responsive genes present at these stress-responsive QTLs to try and link gene functions with the overlying trait response, not least because these are potential candidates for explaining the QTL trait, and could therefore be candidates for marker assisted selection programs. Of particular interest at QTL-1 (cold-tolerance) are genes encoding for a Cyt P450 (possibly involved in ABA degradation), and a K+ channel, at QTL-3 (drought-tolerance), a MYB TF (MYB 36) and chaperonins, while at QTL-6 (drought susceptibility) a bHLH protein, a Na/H+ antiporter could clearly have roles in regulating plant drought stress responses. An up-regulated putative carotenoid cleavage dioxygenase (CCD1, TIGR:LOC_Os12g44310) is a member of a gene family believed to be involved in ABA synthesis in Arabidopsis and which in rice are associated with the negative regulation of the outgrowth of axillary buds . Clearly such interpretations need to be confirmed through additional experiments including confirmation of gene identities and gene expression analysis. Nonetheless it is interesting to note that 5 of the transcripts common between transcriptomic studies of rice-seedling dehydration stress (see 'Meta-analyses' later), and the Musa putative drought stress experiments also colocalize to rice abiotic stress QTLs (table 2), providing further incidental support for the quality of the data and the annotations generated here. To date, the only published comparative gene expression study carried out in banana is the work of Santos and co-workers , who prepared enriched, full-length cDNA libraries from leaves of the cultivar M. acuminata spp. burmannicodes var. Calcutta 4, subjected to temperature stress. Fortunately however large-scale studies of the response of the transcriptome to abiotic (drought) stress in other plants species are available e.g. [32–34]. Of particular interest is the work of Tyagi et al  who examined the responses of rice to abiotic stresses using the Affymetrix Rice Genome Array. In this work, desiccation stress was imposed by drying seedlings between folds of tissue paper for 3 h at room temperature. The expression data sets for the results of these studies were downloaded from the Gene Expression Omnibus (GEO) database at the NCBI website (http://www.ncbi.nlm.nih.gov/geo/ accession number: GSE 6901). This data set contained 6,253 genes that were significantly (>2-fold, p < 0.05) differentially expressed in response to desiccation. Despite fundamental differences in the experimental design and in plant developmental status, 330 of the rice seedling transcripts overlappedsignificantly (p = 0.024) with the list of Musa putative drought-responsive genes, including 5 that colocalised again with the abiotic stress QTLs outlined in table 2. Of these 330 Musa transcripts, 53.4% were up-regulated and 46.6% down-regulated [see Additional file 3]. Overview of the functional classes of the list of 330 dehydration-responsive rice seedling transcripts common to the list of drought-responsive Musa transcripts. Gene annotations and BINS assigned on the basis of Arabidopsis gene accession numbers using the TAIR GO website. Looking at the distribution of gene classes we can see that the up-regulated transcripts common to the rice seedling and Musa drought-stress experiments, contain proportionally more genes involved in 'transport', 'response to (a)biotic stimulus', 'stress response' and 'transcription', while the classes involved with 'cell biogenesis' and 'electron transport and energy production' are down-regulated. This again agrees with generally-accepted patterns of plant responses to drought/desiccation stress. Within the list of functional genes there is an up-regulation of membrane proteins involved in water transport and osmoregulation, as well as proteins for the detoxification of stress-related reactive oxygen species (ROS) such as glutathione S-transferases, hydrolase, catalase, ascorbate peroxidase etc.. The list of common regulatory genes contains members of the homeodomain proteins (2), pathogen-induced (1), MYB (3), ERF-family (2) and one heat stress factor (HSF) TF with proposed functions again characteristic of TFs involved in regulating plant (a)biotic stress-responses. Finally, the list of Musa putative drought-responsive transcripts was compared to the results obtained from dehydration stress experiments in Arabidopsis carried out as part of the AtGenExpress consortium . In these experiments, dehydration stress was imposed by exposing Arabidopsis plants to a dry air stream for 15 minutes on the bench until 10% of their fresh weight was lost . From the list of 518 Arabidopsis differentially expressed genes (>2 fold, p < 0.05), 37 (p = 0.06) and 55 (p = 0.003) Musa gene homologues overlapped with the drought responsive Arabidopsis transcripts from shoot and root tissues respectively. In addition there were 12 Musa transcripts common to all 3 data sets (Musa severe drought stress, and Arabidopsis root and Arabidopsis shoot desiccation stress). Therefore despite substantial differences in experimental design, the results of this meta-analysis indirectly support the provisional gene identities assigned to the drought responsive transcripts in Musa and illustrate the degree of conservation of the pathways of plant stress responses across plant species, even when they are as distantly related as Arabidopsis and Musa. The identity of the Musa transcripts is based on cross-hybridisation with at least of one 25 bp probe per Rice GeneChip® transcript probe-set. To help confirm the validity of the gDNA probe-based approach and the identity of the differentially-regulated transcripts, primers were designed to a number of drought-responsive transcripts. To do this we used an in-house, proprietary database of Musa unigene sequences. For primer design we preferentially used Musa sequences which were 'best hit' in a reciprocal BLASTN query of rice unigene sequences (downloaded from the HarvEST website) versus the Musa unigene database. In total, primers to 14 sequences were used, and the results from the relative expression levels in control and drought stressed foliar tissue are summarised in Figure 5. Overview of the relative transcript abundance of a selection of >2-fold drought-responsive Musa transcripts by semi-quantitative RT-PCR. Primers were designed on the basis of Musa unigene sequences displaying highest homology to the rice unigene sequences. Transcript names correspond to the probe set descriptions given in Additional file 3. Results represent the means of 3 individual PCR-amplifications. 'Expected' = Relative expression levels based on microarray data, 'Found' = transcript expression levels as determined by RT-PCR. As shown in Figure 5, the RT-PCR results generally showed the same trends, and expression levels generally agreed well with the results from the microarray hybrisation experiments. This has previously been demonstrated in other heterologous cross-hybridisation experiments utilising more closely-related plant species [14, 21]. In this work however there were also several cases where the expected Musa relative transcript expression values based on the microarray results significantly differed from the RT-PCR results. These discrepancies probably relate to the difficulty in assigning strict functional annotations and designing primers for (Musa) transcripts based on homologies to the relatively short oligonucleotide probes of quite distantly-related heterologous species. In addition, the Musa unigene collection we used contains only 22,205 unique transcript sequences, which extrapolating from the gene densities of one gene per 4.1 kb reported by Lescot et al  and a haploid genome size of 560 - 600 Mb [22, 23] corresponds to a maximum of only around 16% of the total predicted number of genes present in the Musa genome. This means that in some cases it is possible that the 'true' sequence, with highest homology was simply not present in our unigene collection. In support of this, the sequences that produced relative expression results that were not in agreement with the microarray data generally also had lower E-values, or were transcripts derived from large gene families. Undoubtedly the availability of additional EST and genome sequence data will improve the reliability of transcript identification. Despite the economic and social importance of Musa spp for large sections of the world's population, there have been few systematic studies into banana and plantain responses to abiotic stress [28, 49–51] and none to drought. There are also no published genome-wide stress-studies in Musa and relatively little sequence data is available particularly when compared to other important crops. Further, despite the large number of drought stress-associated genes identified in both model and non-model plant species, there is still no consensus as to the key processes that determine plant tolerance and survival, and in only a few cases has gene function been defined. Therefore it is likely that the study of bananas and plantains, will result in the identification of additional, novel stress adaptation mechanisms and could represent a powerful resource in the search for plant stress-tolerant genes and/or markers. The aim of this work therefore was to evaluate the use of a heterologous microarray approach to profile the transcriptome of the relatively drought-tolerant Musa cultivar 'Cachaco' to chronic drought stress. In contrast to other transcriptomic studies in which short, 'shock-like' treatments have been applied [10, 33, 52] experimental conditions here were chosen to more closely mimic field conditions and thus to identify genes involved in the long-term adaptation and survival of plants to water deficit. 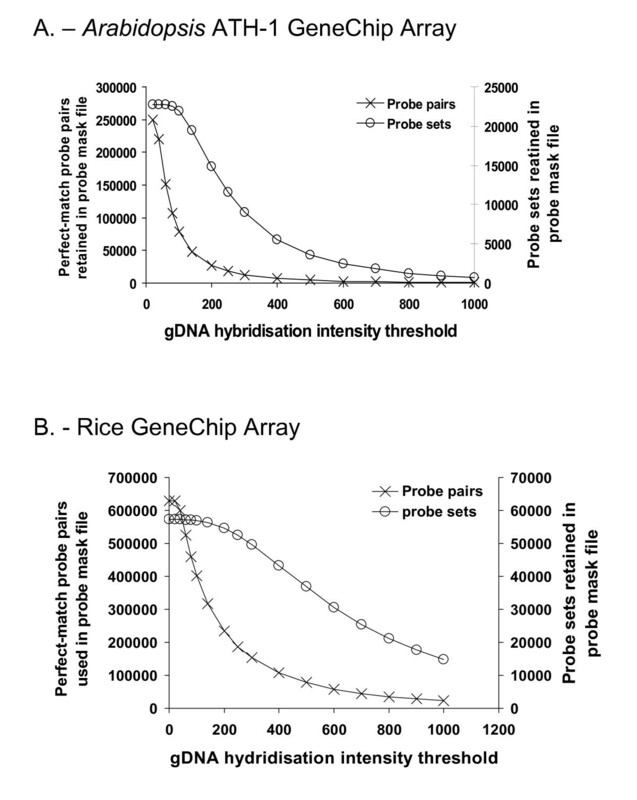 Cross-hybridisation of Musa gDNA to the ATH-1 and Rice GeneChips® showed that the number of probes and probe-sets retained decreased much more rapidly with increasing CDF-values on the ATH-1 array than on the Rice GeneChip®. Nonetheless there was still a sufficient degree of homology between Musa and Arabidopsis to be able to profile a significant proportion of the Musa expressed genome using the ATH-1 GeneChip®. This would thus tend to support the results of comparative sequence studies in Musa, Oryza and Arabidopsis that indicate that Poacea and eudicot genomes share microsyntenic regions [26, 53]. Cross-hybridisation of Musa RNA to the Rice GeneChip® identified 2,910 transcripts (probe-sets) displaying a >2-fold difference in expression levels in response to drought. Gene annotations based on rice and Arabidopsis databases indicated that many of these transcripts were involved in cellular pathways and processes typically involved in plant (a)biotic stress responses, including a number of genes with TF activity. Importantly, our results share significant overlaps with transcriptome studies in other (model) species, with the list of drought-responsive Musa genes including homologues known to be involved in the dehydration stress responses of both rice and Arabidopsis. Furthermore, the list also contained a number of transcripts that co-localized to known rice QTLs for both drought and cold responses, including 2 QTLs for which the underlying genetic determinant has been localized to a single (up-regulated) gene. These could therefore be a good target for marker development and could directly incorporated into Musa breeding and selection programs. These QTL results further suggest that the Musa gene annotations and functionalities assigned on the basis of cross-hybridisation to rice probes are correct and have biological significance. This conclusion is further supported by the results of the RT-PCR results, which largely agreed with the expression results derived from the microarray, except for those cases where homology to available Musa unigenes was very low or where multiple gene models were available. Therefore cross-species (heterologous) microarray studies using gDNA-based probe selection allows the profiling of up to ~58% of the total Musa genome despite the absence of substantial sequence data for this species and the large phylogenetic distance from the target species. This is a substantially larger proportion of the transcriptome than has previously reported for this species and as far as we are aware, the largest phylogenetic distance used in a cross-hybridisation study. gDNA probe-based selection thus represents a powerful tool for the study of complex biological responses in a non-model species. While gene ontologies and function of key transcripts have to be carefully validated, the results here underline the potential of this methodology for the identification of (new) mechanisms and pathways of expression control. In the long term this information can lead to the development of new tools and strategies for the development and breeding of important new crop varieties with improved (a)biotic stress tolerance. All plant material used was obtained as sterile tissue culture from Bioversity's International Transit Center (ITC) located in the Laboratory of Tropical Crop Improvement of Division of Crop Biotechnics, Katholieke Universiteit Leuven, Belgium. These in vitro plants were first transplanted into 7.5 litre polyethylene pots containing equal volumes of an autoclaved mixture of enriched commercial peat soil and sand (2:1, v/v), and allowed to grow and stabilise for approximately three months before the onset of the experiment. Plants were grown at a density of 24 plants per table under a standardised light/dark regime of 12/12 h at 26/23°C respectively with a light intensity of around 10,000 lux (300 watts/m2) and a relative humidity of 75%. At the onset of the experiment, all plants were hand-watered until water drained freely from the base of the pots. The control plants were then watered once a day by flooding the tables with a fertigation solution [see Additional file 4] and allowing the pots to stand for 30 min. Water-deficit (drought) conditions were imposed by withholding water supply for in total up to five weeks. Leaf samples consisted of a 5 - 8 cm wide strip (~3 g fresh weight) removed from one side of the middle of the second, fully expanded leaf down from the top of the plant. Samples were snap frozen in liquid nitrogen and stored at -80°C until analysis. All sampling took place between 14:00 and 17:00 pm. For transcriptome analysis, equal quantities of RNA from 2 replicate plants grown at each time point per treatment were pooled to give a single biological replicate. Genomic DNA (gDNA) was isolated from young leaves which had been kept in the dark for 48 h to deplete starch and polysaccharide levels using a modified CTAB method essentially as according to Michiels et al . Contaminating RNA was removed by addition of 2.5 μl of a 10 μg/ml stock solution of RNase and incubation at 37°C for 30 min. To check the quality and quantity of DNA, 1 μl samples of isolated DNA were run on a 1% agarose gel in TAE buffer (0.04 M Tris-acetate; 1 mM EDTA, pH 8) as outlined by Sambrook et al . After staining of the gel with ethidium bromide for 15 min, DNA concentrations were visually estimated by comparison to different amounts of λ-DNA run at the same time. gDNA quality was determined spectrophotometrically using the AU absorbance ratios at 260/280 nm. Samples with a 260/280 ratio of 1.9 - 2.0 were considered as 'pure'. RNA was extracted using a modified Tris-LiCl method, based on the work of Tattersall et al . The modifications involved a DNAse treatment and an additional phenol:chloroform cleanup step. RNA concentrations and purity were determined using a MultiScan Spectrum microtitre plate scanning UV-VIS spectrophotometer (Multiskan Spectrum, Thermolabsystems, Brussels, Belgium). For purity assessment, the AU 260/280 and AU 260/230 ratios were measured and samples with a ratio of ~2.0 were considered as 'pure'. One microgram of total RNA sample was also run on a 1% agarose gel containing ethidium bromide in TAE buffer to check for possible degradation . Gels were imaged using a GelDoc 1000 gel imaging system and Molecular Analyst v1.5 image analysis software version 4 (Bio-Rad, Hercules, CA). gDNA hybridisation was carried out essentially as described by Hammond et al . In brief, Musa gDNA was labeled using the Bioprime DNA hybridisation System (Invitrogen) and subsequently hybridised to either the Arabidopsis ATH1 or Rice, Genome Arrays for 16 h at 45 C, using standard Affymetrix hybridisation protocols. This was then followed by the Affymetrix eukaryotic wash protocol that included antibody staining. The GeneChip® Genome Arrays were then hybridised with 0.5 μg of target Musa gDNA and scanned on a G2500A GeneArray scanner. Only one gDNA hybridisation was performed, as replicate gDNA hybridisations all challenge the GeneChip® arrays with the whole genome. From these results a gDNA cell intensity file (.cel file) was generated using the Microarray Analysis Suite software (MAS, v5.0, Affymetrix). This .cel file contains the hybridisation intensities between Musa gDNA fragments and all the A. thaliana or Rice GeneChip® oligonucleotide probes. The .cel files have been submitted to GEO (Accession ID = GSE16865) and are also available from the NASC Xspecies webpage http://affymetrix.arabidopsis.info/xspecies/. Probes showing a suitably strong cross-hybridisation signal were selected from the .cel file using a .cel file parser script (Xspecies v 1.1, available with instructions at http://affymetrix.arabidopsis.info/xspecies/) written in the Perl programming language http://www.perl.com. This Perl script creates a probe mask (.cdf) file, which is compatible with a range of microarray analysis software packages and provides the template for the generation of a signal across the probe-set when analyzing the test (Musa) transcriptome (i.e. the RNA .cel files). Specifically it allows information to be extracted from the RNA .cel files for only those probe-pairs whose perfect-match (PM) probe gDNA hybridisation intensity value is above a user-defined hybridisation intensity threshold (CDF value). In practice the optimal gDNA CDF is determined systematically and empirically using probe masks created with CDF values of between 50 and 1000 (see 'Results'). A probe-set is retained for analysis when it is represented by at least one PM probe-pair per probe-set. Therefore one 25 bp probe, identical in sequence to a Musa gDNA fragment is the minimum requirement for inclusion of that probe-set in the subsequent transcriptome analysis of the target Musa RNA. The transcriptional responses of the Musa cultivar 'Cachaco' to severe drought were determined by challenging rice GeneChip® Genome Arrays with Musa foliar RNA, isolated and pooled from two replicate plants subjected to either 3 weeks water-deficit conditions or to control conditions. Approximately 5 μg of Musa total RNA was reverse transcribed at 42°C for 1 h to generate first strand cDNA using 100 pmol oligo dT(24) primer containing a 5'-T7 RNA polymerase promoter sequence, 50 mM Tris-HCl (pH 8.3), 75 mM KCl, 3 mM MgCl2, 10 mM dithiothreitol (DTT), 10 mM dNTPs and 200 units SuperScript II reverse transcriptase (Invitrogen Life Technologies). Following first strand cDNA synthesis, second strand cDNA was synthesised using 10 units of Escherichia coli polymerase I, 10 units of E. coli DNA ligase and 2 units of RNase H in a reaction containing 25 mM Tris-HCl (pH 7.5), 100 mM KCl, 5 mM MgCl2, 10 mM (NH4)SO4, 0.15 mM β-NAD+ and 10 mM dNTPs. This second strand synthesis reaction proceeded at 16°C for 2 h before 10 units of T4 DNA polymerase was added and the reaction allowed to proceed for a further 5 min. The reaction was terminated by adding 0.5 M EDTA. Double stranded cDNA products were purified using the GeneChip® Sample Cleanup Module (Affymetrix). The synthesised cDNAs were transcribed in-vitro using T7 RNA polymerase (Enzo BioArray High Yield RNA Transcript Labelling Kit, Enzo Life Sciences Inc., Farmingdale, NY, USA) and biotinylated nucleotides to generate biotinylated complementary RNAs (cRNAs). The cRNAs were then purified using the Affymetrix Sample Cleanup Module (Affymetrix) and randomly fragmented at 94°C for 35 min in a buffer containing 40 mM Tris-acetate (pH 8.1), 100 mM potassium acetate, and 30 mM magnesium acetate to generate molecules of approximately 35 to 200 bp. Affymetrix A. thaliana ATH1 Genome or Rice Genome Arrays were then hybridised with 15 μg of fragmented, labeled cRNA for 16 h at 45°C as described in the Affymetrix Technical Analysis Manual. GeneChip® arrays were then stained with Streptavidin-Phycoerythrin solution and scanned with an Affymetrix G2500A GeneArray scanner. The Microarray Analysis Suite (MAS Version 5.0; Affymetrix) was used to generate .cel files for each of the RNA hybridisations by scanning and computing summary intensities for each probe without the use of probe mask files. The .cel files have been submitted to GEO (Acession ID = GSE16865) and are also available from the NASC Xspecies webpage http://affymetrix.arabidopsis.info/xspecies/. These .cel files were then loaded into the GeneSpring (Agilent Technologies) analysis software package using the Robust Multichip Average (RMA) pre-normalisation algorithm . During .cel file loading and pre-normalisation, .cel files were interpreted using either, (1) the respective A. thaliana or rice .cdf files (i.e. with no probe-selection used), or (2) using .cdf files generated from the Musa gDNA .cel file with CDF values ranging from 0 to 1000. Following RMA pre-normalisation and masking of individual probes, each probe-set signal value from treated (drought stressed) samples was standardised relative to the probe-set signal value of its corresponding control, to give the relative gene expression ratios between the two conditions. Rice and Arabidopsis gene annotations (GO ontology's; http://www.geneontology.org) for >2-fold differentially-regulated Musa transcripts cross-hybridising to oligonucelotide probes on the Rice GeneChip®, were assigned using the NetAffx web tools software http://www.affymetrix.com/analysis/index.affx from Affymetrix, or the HarvEST program http://www.harvest-web.org. Functional classifications of the genes were assigned using the gene ontology (GO) function at the TAIR website http://www.arabidopsis.org/tools/bulk/go/index.jsp, or the GeneSpring software. The significance of these classifications was calculated using a hypergeometric distribution test http://stattrek.com/Tables/Hypergeometric.aspx. The AGI codes of the Arabidopsis equivalents the Musa transcripts were obtained from the Affymetrix website, and used to allow expression data to be loaded and analysed in MapMan software for visualization of the cellular pathway responses [40, 58]. Results were compared with publicly available comparative transcriptome studies of plant abiotic stress responses in rice (Oryza sativa) and A. thaliana. The list of drought-responsive Musa transcripts obtained at a probe mask hybridisation intensity of CDF-550, were compared to the list of A. thaliana dehydration stress-responsive genes identified by the AtGenExpress consortium  using the MetaAnalyzer tool of Genevestigator . In addition, data from a recent large scale comparative transcriptomics study of the response of rice seedlings to abiotic stress using the Affymetrix Rice Genome Array by Tyagi et al is also available . In these studies, desiccation stress was imposed by drying seedlings between folds of tissue paper for 3 h at room temperature. The expression data sets for these studies were downloaded from the Gene Expression Omnibus (GEO) database at the NCBI (http://www.ncbi.nlm.nih.gov/geo/ accession number GSE 6901), and the list of differentially expressed genes overlapping with the list of drought responsive Musa transcripts identified that were >2 fold different between treated and control samples and using an ANOVA test (p < 0.05). The significance of gene list overlaps was calculated using a hypergeometric distribution test http://stattrek.com/Tables/Hypergeometric.aspx. Finally, the list of differentially drought-regulated Musa genes was compared to genes located at known QTLs for drought and other abiotic stresses localized on the physical genetic map of rice. The position of the QTLs were viewed in Gramene http://www.gramene.org/ and the list of underlying genes present at each QTL compared to those present in the CDF-550 list. To verify GeneChip® array expression data, semi-quantitative RT-PCR was performed on first strand cDNA prepared from the same 'Cachaco' 3-week, control and drought RNA samples used for the microarray cross-hybridisation experiments. One μg of total RNA from pooled leaf samples derived from 2 individual plants per condition, was used for reverse transcription using the SuperScript II Reverse Transciptase using conditions recommended by the manufacturer (Invitrogen). The cDNA synthesis reaction was carried out using oligo-dT(18) primers (50 μg ml-1). PCR amplification of the first strand cDNA was carried out using gene specific primers for a number of transcripts showing >2-fold difference in expression. Primers were designed using an in-house database of Musa EST sequences created from available on-line GenBank sequences and a 3' EST database donated to the Global Musa Genomics Consortium by Syngenta. From the original 48,445 EST sequences, 33,038 were clustered to give 9,251 contigs which together with the remaining singletons produced a final collection of 22,205 unique Musa unigene sequences. To link the Musa EST sequences with the transcripts identified by cross-hybridisation to the Rice GeneChip® microarray, a local BLAST search of the Musa unigene sequences versus the entire rice Unigene set (Assembly 1.09), downloaded from the HarvEST website was carried out at E-value stringency settings of both 10 and 0.1. In addition rice Unigene sequences corresponding to the differentially drought-regulated Probe-sets were BLASTed against the Musa unigene dataset. Primers for semi-quantitative PCR were designed to the cDNA sequences of those Musa gene homologues localized within the QTLs for abiotic stress responses in rice as well as a Musa Actin-1 control transcript (GenBank accession AF285176). Primers were designed using the Primer3 primer design tool ; http://frodo.wi.mit.edu/cgi-bin/primer3/primer3.cgi and initial primer sequences were checked for secondary structures using the netprimer program, http://www.premierbiosoft.com/netprimer/index.htm. PCR reactions were carried out using 25 μl per reaction consisting of 2 ng of cDNA sample, 1 μM of 5'- and 3'-primer and 7.5 μl of master mix. The reaction conditions were 94°C (2 min) for one cycle, and then 94°C (30 s) and 55°C (30 s) and 72°C (30 s), for 24 - 32 cycles, before a final extension of 72 C for 10 minutes. Transcript levels of each gene were normalized to Musa Actin-1, and the expression of each gene expressed relative to the expression in control plants [see Additional file 5]. Mark W Davey, Neil S Graham contributed equally to this work.